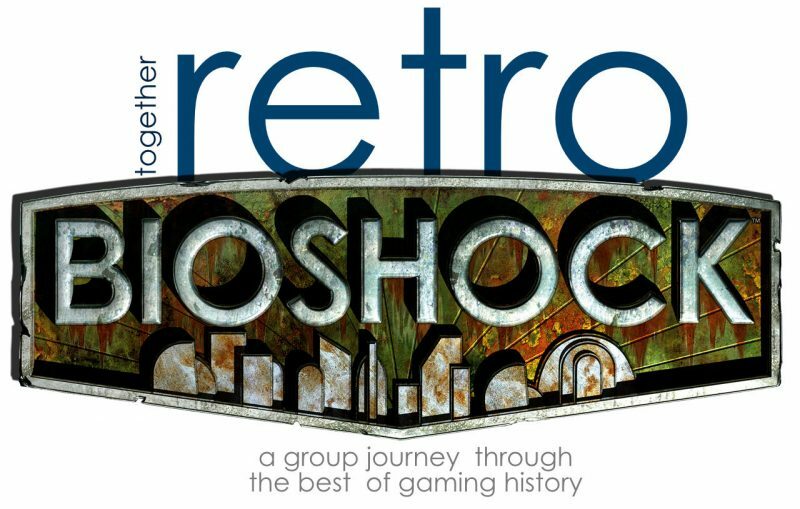 This month’s Together Retro game is Bioshock, which is available on the PC, the PS3, and the Xbox 360. There is also a “remastered edition” of the game available for the PC, the Xbox One, and the PS4. 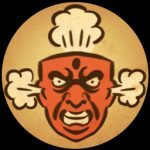 In celebration of the tenth anniversary of Irrational Games’ monumental achievement, this spoiler-free Together Retro entry on the game offers a slightly different approach to the monthly column. There have been very few games with the sheer impact on the game industry as 2007’s Bioshock. It is a game that, significantly, pushed the medium forward near the start of the 20th Century with a meticulously crafted engagement with and critique of the art, politics, philosophy, and game design ideas of the 20th. In Bioshock, players are made to look through the glass darkly at a nearly possible past, at a potentially looming future, and at some of the underlying unease that has long defined American life. (That critical spirit that would eventually inform two well-received sequels in 2010’s Bioshock 2 and 2013’s Bioshock Infinite, but Bioshock is in many ways the undisputed high-water mark for the series.) Bioshock is built on the aesthetics of art deco, the music of the World War II generation, the philosophy of Ayn Rand, the religious zeal of Christian Evangelicalism, the science of genetic modification, and the game design principles of several popular genres. It is a game that is at times overtly political, at times intensely disorienting, and at times an engine for pure catharsis via gameplay. 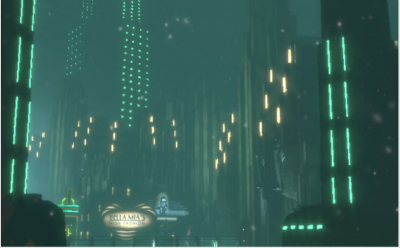 The game’s legacy is one that has echoed as much across the modern video game industry as it has across modern games criticism and, with that influence in mind, this article considers how some of Bioshock’s constitutive elements functioned both discretely and in concert to make the game become the landmark title it is regarded as today. By most accounts, Bioshock began its formal development in 2002, a few years after Ken Levine and his team released System Shock 2. That game, released in 1999, was a critical success celebrated as much for its dystopian 22nd Century cyberpunk fiction as it was for its game design and technical achievement. In many ways, the decade of development that comprised Irrational Games’ work on the horror-tinged narratives in both System Shock 2 (SS2) and Bioshock was one that itself was especially uneasy as the United States headed towards the new millennium. Cultural panic about the Y2K bug pervaded the late 1990s and capped off a decade marked by a palpable excitement about but underlying mistrust of rapidly emerging new media technologies. In the United States, in the wake of the September 11, 2001 terrorist attacks and the subsequent invasions of Iraq and Afghanistan, the early 2000s were marked by cultural fears about a new century of religiously-inflected warfare. With the “Shock” titles straddling either side of the year 2K, it is perhaps fair to read SS2 as a warning against a possible future and Bioshock as a warning against the specter of the past. What we know about early builds of Bioshock and their connections to the final version of the game supports this thesis. The early 2002 demo of the game was built around heavy religious themes. Levine explained in an interview that the original premise for the game would have involved the player playing as a cult deprogrammer, the kind of “people who hired people to [for example] deprogram their daughter who had been in a lesbian relationship… They kidnap her and reprogram her, and it was a really dark person, and that was the [kind of] character that you were.” Levine added that the deprogrammer would have been “hired by a senator.” That Levine would have wanted to blend together religion and politics in the telling of Bioshock’s story was not surprising, as during the game’s development both were deliberately and often linked together in the discourses emanating from and surrounding the George W. Bush administration (most famously, perhaps, in Bush’s statement that “God would tell me, ‘George, go and fight those terrorists in Afghanistan.’ And I did, and then God would tell me, ‘George, go and end the tyranny in Iraq .’ And I did.”). There was also, in 2002, a growing public awareness of the harms of gay-conversion therapies that were often endorsed by many Christian groups (the APA released a statement condemning the practice in 2000 and the US Surgeon General denounced the premises of these “therapies” in 2001). Though those specific narrative ideas were ultimately scrapped, many of these specific political and religious themes (and their connection to one another) would live on in the retail version of Bioshock, aptly capturing these components of early 21st Century American cultural milieu. 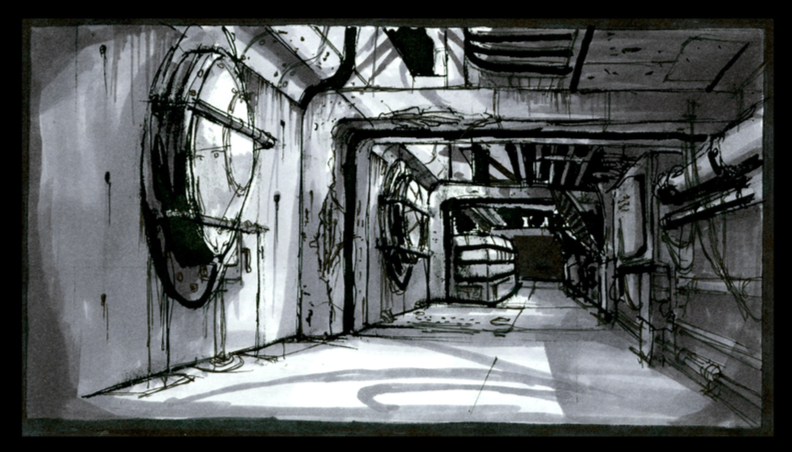 Another early build of the game that ended up being scrapped set the title in an abandoned Nazi bunker on a tropical island. 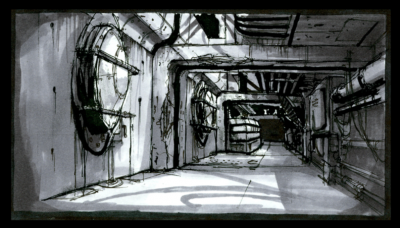 As in the retail release, this early build of the game featured genetically-engineered enemies who the player would have to face down, but as with SS2, the game was set in the near future (Gamespot reported that “the complex has only recently come back into use by the scientists circa the early 21st century”). With this narrative choice, Levine and crew were seemingly drawing implicit connections between the kinds of experimentation Nazi Germany was infamous for and the then-recent headlines around contemporary genetic research. In 2001, for example, a complete draft of the human genome was announced before a final complete version was published in Nature in 2005. 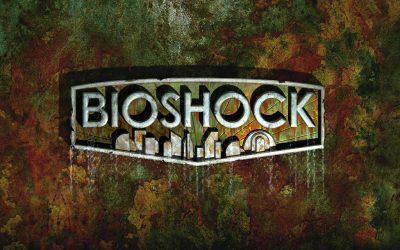 Bioshock was not unique on this score, as a number of other popular science-fiction, horror, and fantasy media had begun to address the topic in earnest during the era in which development of SS2 and Bioshock took place (e.g. Gattaca (1997), the Matrix films (1999-2003), X-Men (2000), Code 46 (2003), etc.). Though the final build did not set the game in a Nazi-infected future, connecting the 1930s and 1940s to the present day as a central narrative device undoubtedly has some of its origins here. 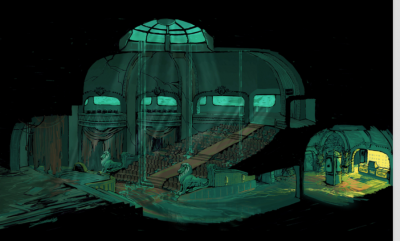 When released, it turned out that Bioshock would explore many of these cultural anxieties through the many nuances found within the city (and the concept) of Rapture, the underwater ruin that players traverse as they play through the game. “Rapture,” a term with both apocalyptical and religious connotations (as a proper noun) and with connotations of intense pleasure (as a common noun) is an exceedingly suitable name for an environment inhabited by narcissistic futurists, crazed cultists, and disaffected children in a geophysical location that exceeds the temporality and spatiality of human civilization. At the turn of the millennium, when many of our own futures seemed especially uncertain, Bioshock arrived to stoke those fears, offer biting commentary on them, and deliver an intense engagement with the past as a way to confront them. How it did that was what made the game special. Renowned mid-20th Century thinker Kenneth Burke, a theorist of language, persuasion, and meaning-making, wrote in the 1930s about an idea known as “perspective by incongruity”. In a nutshell, it is the idea that when you can view one concept from the perspective of another seemingly unrelated concept, a kind of productive juxtaposition occurs in which both concepts are then understood differently and, in fact, a new (third) perspective can often emerge. Bioshock’s art is nothing if not a case study in perspective by incongruity. The brilliance of Bioshock lies, in no small part, in its artistic direction. Bioshock is a game very much about details, and those details are most pronounced in the game’s mining of early 20th Century popular culture: art deco frescos, modernist architecture, up-tempo jazz music, ragtime tunes, big band and swing classics. Collectively, set in an underwater dystopia, these artistic choices create a world unlike any other seen in video games. In the introduction to Breaking the Mold: The Art of Bioshock (which you can totally download for free) Levine wrote “It’s a hard bridge to gap, in an industry where almost everything is either Aliens sci-fi, Lord of the Rings high fantasy, or Saving Private Ryan well, you know.” Bioshock can reasonably be considered a novel mixture of visual influences; it is part steampunk, part zombie horror, part submarine movie, part classic pulp sci-fi covers, and part Lovecraftian-tinged surrealism. It blends and transcends these themes and creates something memorably unique. Indeed, when one considers the things that Bioshock accomplished (a captivating single-player experience, a clearly-made philosophical critique with timely political commitments, the establishment of a successful franchise, the legacy of its influence on the game industry, etc. 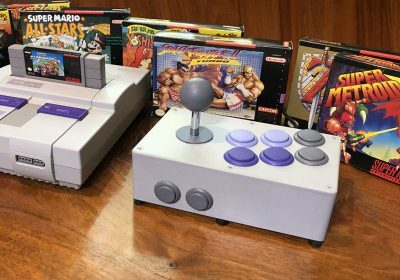 ), it can reasonably be argued that the decisions in the game’s art direction are at least as important as the game’s writing and game design. As players move through the game’s undersea corridors they hear, appropriately, Bobby Darin’s “Beyond the Sea” and Reinhardt and Grappelli’s “La Mer”; we also encounter standards such as Perry Como’s “Papa loves Mambo” and Billie Holiday’s “God Bless the Child” along with a host of songs closely associated with grand ballrooms, black-tie affairs, and a time of growing American economic prosperity built upon a fermenting awareness of widespread social inequality. 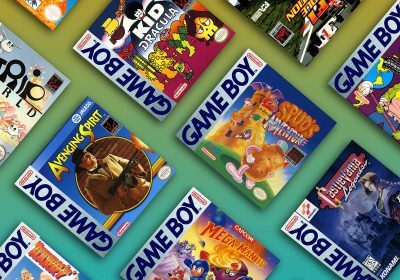 Accordingly, the presentation of much of the game’s licensed music – a carefully curated selection of major and minor hits from the 1930s, 1940s, and 1950s – is often deliberately distorted; songs skip, are truncated, are seemingly piped through tin cans, echo eerily in cavernous halls, or are off-key and full of warbles. 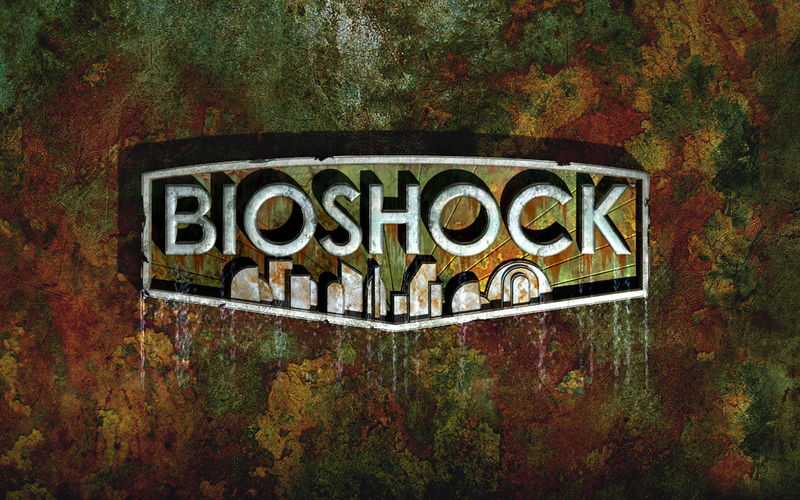 (Much of Bioshock’s original score also reflects these themes). For players, the unsettling impact of the concocted vibe whilst they moved through the game was unmistakable: joyfulness becomes skewed as melancholy whilst the crazed denizens of Rapture seemingly twitch and shout in time with the music of time-gone-by. As is the case with the music, the art and architecture that one encounters inflects a particular form of American grandeur. And, likewise, across this imagery – from the advertisements that are reminiscent of classic early “full color” Life Magazine ads, to the stylized World War-era propaganda poster illustrations that are built into the game’s systems, to the towering steel statues, ceramic tile corridors, and sharply angular interior designs of Rapture’s buildings – one finds constant disrepair. The juxtaposition of the rotting, flaking, fading, and crumbling underwater city with the formerly aggressive splendor and seemingly effortless beauty of its creation underscores the desperateness of the situation and the need for the player to escape. Much of the game’s brilliance lies in how it enabled you to try to do just that. Bioshock’s gameplay is in some ways a simplification and refinement of that found in System Shock 2, Levine’s earlier stab at defining the still-nascent genre of the FPS/RPG hybrid. Though early approaches to the blended genre had found a significant degree of critical acclaim with the System Shock (1994, 1999) titles and with the thematically-adjacent Deus Ex (2000) games, these games failed to achieve the kind of sales figures that would contribute to making Bioshock the juggernaut it became. 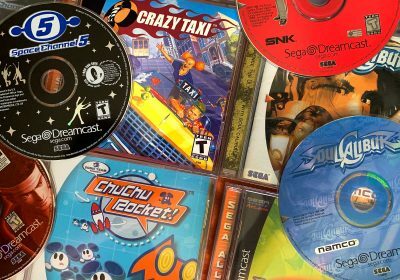 (System Shock and Deus Ex each sold about 150,000 copies in the year of their release,System Shock 2 sold about 60,000 in its first year of sales, and Bioshock sold about 2.5 million in its first year). The heart of Bioshock’s gameplay is a now-familiar blend of intense moments of fast-paced shooting broken up by quieter stretches of resource scavenging, skill tree unlocking, and ammo hunting. Players can choose a variety of approaches to spec out their character, and the game offers a compelling set of unique supernatural abilities and traditional firearms that can themselves all be augmented, leveled up, or otherwise modified. At the time (especially on home consoles), giving players agency to make these kinds of choices was enough to set Bioshock apart from the competition and, in conjunction with its bold political and artistic choices, positioned the title as a kind of “thinking-person’s shooter”. Most importantly, Irrational Games built Bioshock’s systems right into the fabric of Rapture itself. The non-player characters one confronted were often after the same resources, the signage players encountered offered useful world information, and the objects players interacted with as they passed through various buildings rarely came across as obvious elements of game-design (vita-chambers and trashcan loot notwithstanding, perhaps). There was an organic feel to much of the experience and a sense that everything in Rapture was of a purpose. Perhaps the best example of the nuances of Bioshock’s gameplay design are found in the memorable battles with the game’s Big Daddies. When players chose to confront these challenging boss-type enemies, the game compelled them to carefully plan out their usage of various attack powers, weapons, and movement abilities. This video captures much of that intensity, and is a good introduction to the appeal of these systems working in concert. 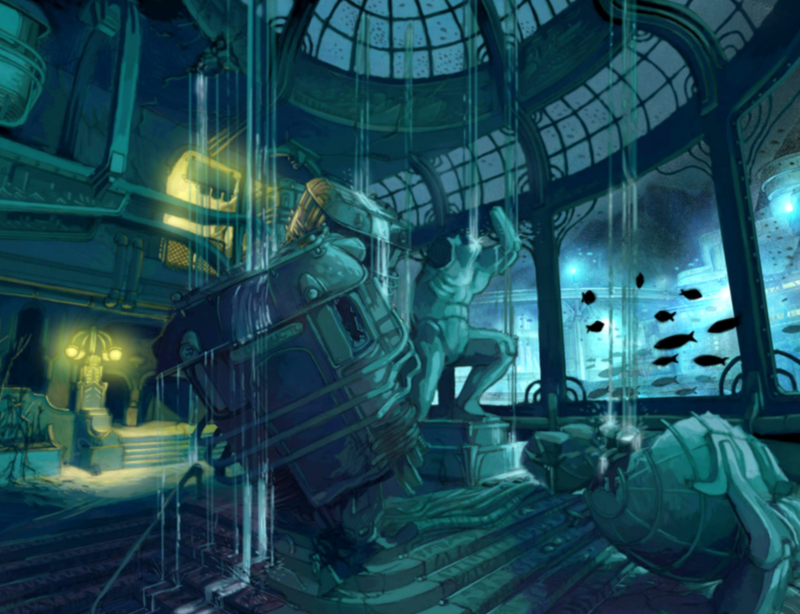 Though the game’s art direction and gameplay design are key features of its success, Bioshock may ultimately be best remembered by many gamers for its narrative. 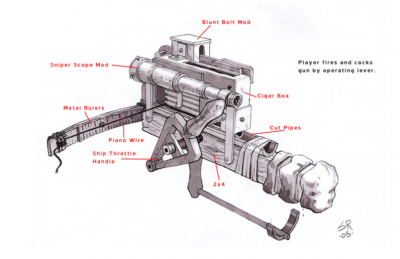 The game offered a number of surprising twists and turns that were (at the time) especially ground-breaking in the medium and, in addition, afforded players a certain degree of choice not typically seen in first person shooters. Discussing those elements of the game in this essay would ruin the experience for new audiences so, instead, a consideration of the narrative’s central philosophical themes (many of which are revealed in the first few minutes) will suffice to highlight the skillfulness of Levine’s writing. Bioshock’s story is above all a damning critique of the telos found in the Objectivism philosophy of Ayn Rand. That critique is evidenced not only in the decaying world of Rapture, a city built on the dreams of Randian protaganist stand-in Andrew Ryan (and contested by Ryan’s rival, Frank Fontaine), but in the kinds of choices players face as they traverse it. The destruction and death that define the city for the player serves as a clear rebuttal to this vision, a warning against the hubris and selfishness found in its instantiation. As indicated above, Bioshock was from its inception designed to be conversant with the politics of its own time, and during the game’s development Rand’s ideas were finding a lot of public scrutiny because of statements made by a different Ryan: U.S. Congressman Paul Ryan. That Ryan, who began serving in the U.S. House as a Representative from Wisconsin in 1999, initially made national headlines for his youthful energy and early success. It was then across a string of interviews early in his congressional career that Ryan disclosed an adoration for Ayn Rand’s work. He noted in 2003, for example, that “I give out [Rand’s] ‘Atlas Shrugged’ as Christmas presents, and I make all my interns read it.” In an earlier interview, Atlas was a book Ryan listed alongside The Bible and Friedrich von Hayek’s The Road to Serfdom as the three he re-reads most often. (Ryan, now U.S. Speaker of the House, continues to mention Rand. In 2014, NYMag put together a fairly comprehensive list of Ryan’s Rand infatuation, including references to his 2009 video discussing her here.) Whether Levine was specifically following Ryan’s rise to power during Bioshock’s creation or not, he certainly must have recognized the growing influence of Randian philosophy across the splintering right-wing in American politics when he chose to tackle the subject in Bioshock. Part of the game’s appeal is that it is covertly political: Rand’s name is not mentioned, direct references to political parties are absent, and one may conceivably play the game without ever picking up on any of the more intellectual themes that are used to construct its narrative. Indeed, how Bioshock offers its critique and tells its story is especially worth noting. It was one of the earliest games to popularize the “in-game audio log” style of storytelling, as players often wander around the game while listening to discovered recordings made by former residents of Rapture. (There are, of course, plenty of in-game interactions with NPCs that also shape the central story). These audio logs build on the significance of the kinds of choices that the player faces along the way, and collecting them enroute towards the game’s final hours is well worth doing to get a full sense of the complexity of Levine’s writing. 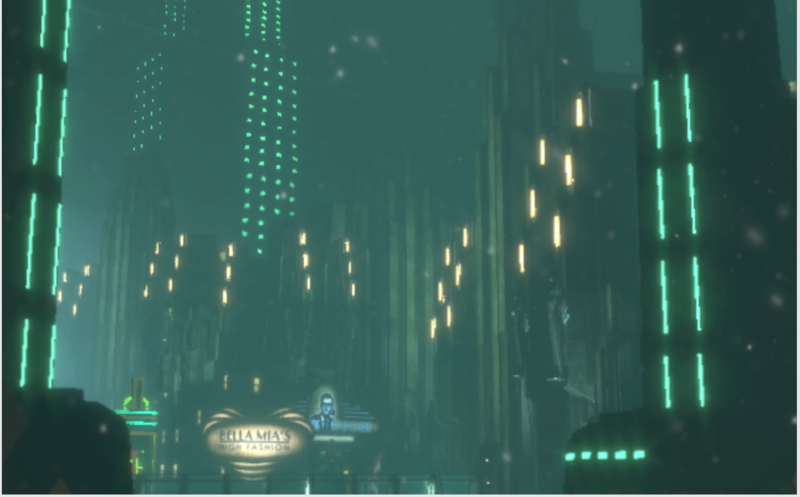 Bioshock’s successful attempt at addressing more intellectually-stimulating themes than was typically found in most games of its type contributed to its success with critics, who collectively produced an abundance of articles discussing in detail many of the features that have been addressed briefly in this essay. The game also found some sharp detractors that addressed disconnects in its particular marriage of gameplay and story. Most notably, Clint Hocking (Splinter Cell, Far Cry 2, etc.) offered a fascinating (and fair) critique of what he termed the game’s “ludonarrative dissonance” in an article which is a highly recommended post-game read. 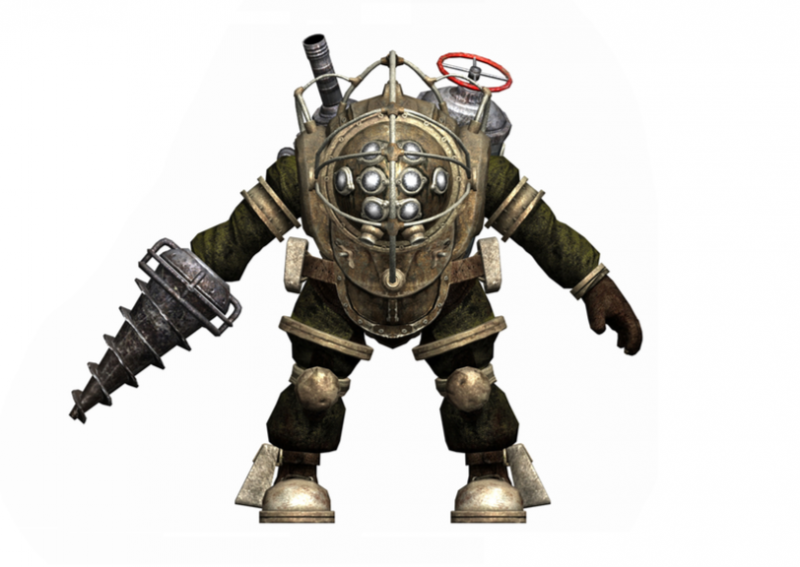 Bioshock’s influence has been significant both in video games and beyond. 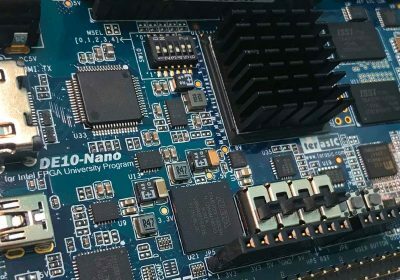 The design ideas it offered to the hybrid FPS/RPG genre which it refined (and ultimately popularized) was further modified by many best-selling games that came out in the years immediately after its success (e.g. Fallout 3, Borderlands, Deus Ex: Human Revolution, etc.). 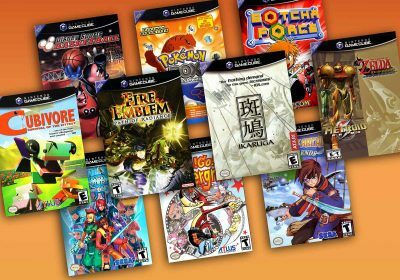 On the recent occasion of the game’s tenth anniversary, the AV Club offered a round table discussion on this topic, where they argued that its influence could also be found in many other places in the years since its release (e.g. in games like Gone Home and Firewatch). 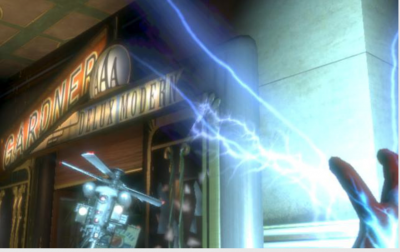 After the externally developed Bioshock 2, Levine returned to the series’ helm to explore many similar ideas in 2013’s Bioshock Infinite, a game which connected directly and indirectly to many of the events that took place in Rapture. We’re talking about this game on the forums, so please feel free to join us there! 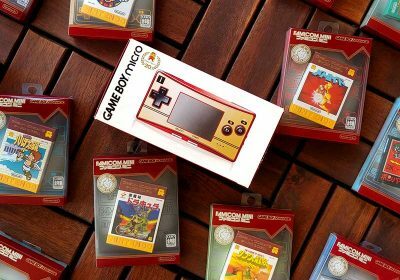 A game from the previous generation is considered Retro now? Ah — fixed now — thank you!